Objective: To determine the effect of extracts from Phyllanthus acidus (P. acidus) (L.) Skeels and Rhinacanthus nasutus (R. nasutus) (L.) Kurz leaves on melanogenesis and the underlying mechanism in normal human epidermal melanocytes (NHEM) and a reconstitutive skin model. Methods: NHEM and a reconstitutive skin model were stimulated with ethanol extracts of P. acidus (L.) Skeels and R. nasutus (L.) Kurz leaves. mRNA expression of microphthalmia-associated transcription factor (MITF), tyrosinase (TYR), tyrosinase-related protein 1 (TYRP1) and dopachrome tautomerase (DCT) were examined by real-time PCR. The melanin content in NHEM was also measured. Moreover, protein levels of tyrosinase were determined using western blot analysis. Results: In NHEM and the reconstitutive skin model, ethanol extracts from P. acidus (at 12.5 and 25.0 μg/mL) and R. nasutus (at 6.25 and 12.50 μg/mL) significantly diminished mRNA expression of MITF, TYR, TYRP1 and DCT in a concentration-dependent manner. P. acidus and R. nasutus extracts also reduced the amount of melanin in α-MSH-stimulated NHEM. Moreover, P. acidus and R. nasutus extracts markedly suppressed tyrosinase at the translational level in the reconstitutive skin model. Conclusions: P. acidus and R. nasutus extracts significantly reduced melanogenesis in NHEM and the reconstitutive skin model, suggesting that P. acidus and R. nasutus extracts can inhibit melanin synthesis through downregulation of MITF, TYR, TYRP1 and DCT. Therefore, the ethanol extracts of P. acidus and R. nasutus contain compounds that have the potential for development as a skin lightening agent for the treatment of hyperpigmentation disorder or melasma. Foundation project: This work was financially supported by by research grant from Kao Melanin Workshop (KY), by Grant-in-Aid for Challenging Exploratory Research 16K15542 (KY) and a Grant-in-aid for Scientific Research C 24591622 (KY) from the Ministry of Education, Culture, Sports, Science and Technology, Japan, by Novartis Pharma Research Grants (KY), and by grants from the Department of Dermatology, Tohoku University Graduate School of Medicine, Japan. We thank Chanat Kumtornrut for helpful discussions about the results. Finally, we greatly appreciate Professor Dr. Duncan R. Smith (Institute of Molecular Biosciences, Mahidol University) for his reviewing of this manuscript and was grateful manuscript writing camp from School of Allied Health Sciences, Walailak University. To determine the potential toxicity of P. acidus and R. nasutus extracts, NHEM were treated with different concentrations (3.125 to 100.000 μg/mL) of each extract and 1 μM of α-MSH for 48 h and cell viability were determined by the MTT assay. Low concentrations of P. acidus extract (3.125-25.000 μg/mL) did not affect NHEM cell viability though higher concentrations (50.000-100.000 μg/mL) significantly suppressed viability [Figure 1]A. The R. nasutus extract between concentrations of 3.125-12.500 μg/mL also did not affect NHEM cell viability [Figure 1]B. Therefore, we used the two highest non-cytotoxic concentrations; 12.50 and 25.00 μg/mL of P. acidus and 6.250 and 12.50 μg/mL of R. nasutus, in further experiments. 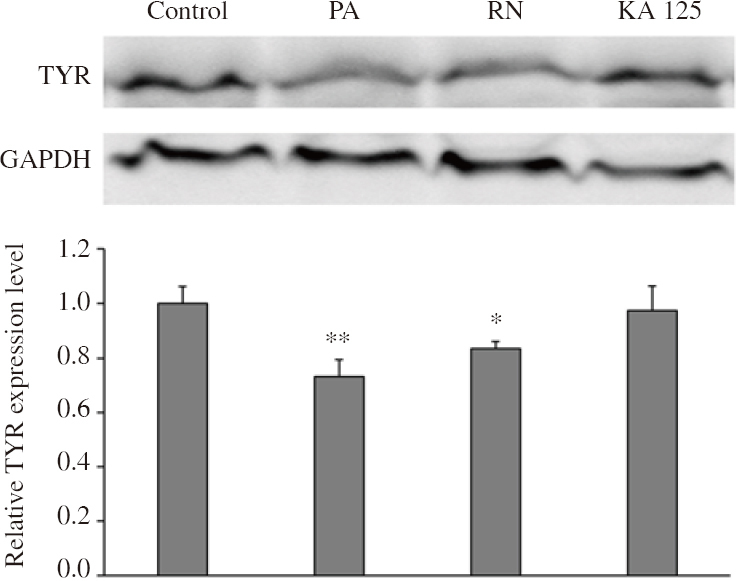 Figure 1: Effects of P. acidus (PA) and R. nasuthus (RN) extracts on cell viability in NHEM. (A) PA at 3.125-100.000 μg/mL or (B) RN at 3.125-100.000 μg/mL. Percentage values of cells treated with PA and RN extracts are expressed as relative values (%) to control cells. Data are shown as the mean±SEM from three independent experiments. *P<0.05, **P<0.01 compared with α-MSH treated cells. We examined whether P. acidus and R. nasutus extracts affected the transcription of melanogenic enzymes such as MITF, TYR, TYRP1 and DCT. 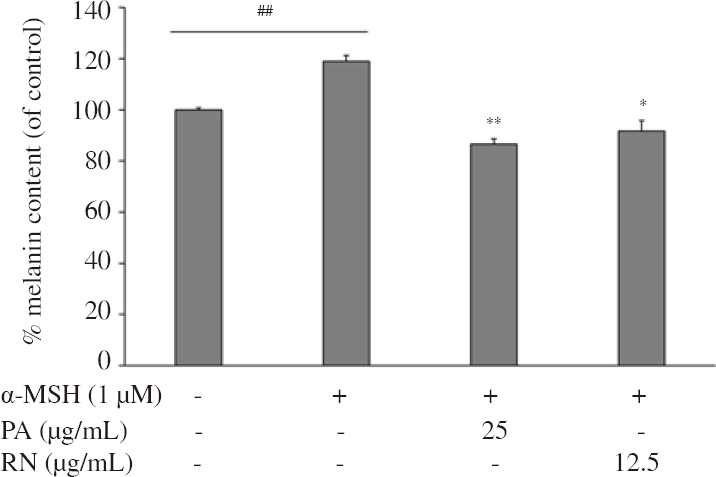 α-MSH increased mRNA expression of these melanogenic enzymes, and P. acidus and R. nasutus extracts significantly suppressed the α-MSH-dependent increase in MITF, TYR and DCT expression in a concentration-dependent manner [Figure 2]A, [Figure 2]B and [Figure 2]D. P. acidus extract also significantly reduced TYRP1, while R. nasutus extract at the concentration of 12.5 μg/mL but not 6.25 μg/mL decreased TYRP1 [Figure 2]C. These results suggest that the P. acidus and R. nasutus extracts modify melanogenesis enhanced by α-MSH through suppression of MITF, TYR, TYRP1 and DCT expression. Figure 2: Effects of PA and RN extracts on mRNA levels of MITF, TYR, TYRP1 and DCT in NHEM. (A) MITF, (B) TYR, (C) TYRP1, and (D) DCT were examined by qPCR, using GAPDH as an internal control. ##P<0.01, ###P<0.001 compared with control cells. *P<0.05, **P<0.01, ***P<0.001 compared with α-MSH treated cells. To determine the effects of P. acidus and R. nasutus extracts on melanin synthesis, we stimulated NHEM with 1 μM of α-MSH for 48 h together with each ethanol extract. As shown in [Figure 3], α-MSH markly enhanced the melanin content in NHEM by about 18% when compared with control cells (without α-MSH treatment). The P. acidus extract at a dose of 25 μg/mL, and the R. nasutus extract at a dose of 12.5 μg/mL significantly diminished the amount of melanin as compared to the α-MSH-treated cells. These results indicate that P. acidus and R. nasutus extracts exert an anti-melanogenic effect on NHEM. Figure 3: Effects of PA and RN extracts on melanin synthesis in NHEM. Percentage values of treated cells relative to control cells are shown. Data are the mean±SEM from three independent experiments. ##P<0.01 compared with control group; *P<0.05, **P<0.01 compared with α-MSH treated cells. To gain further understanding of the effects of P. acidus and R. nasutus extracts on melanogenic mRNA expression in human skin, we employed a reconstitutive skin model. The reconstitutive skin model has an epidermal layer consisting of NHEK and NHEM on top of a dermal layer containing dermal human dermal fibroblasts in a collagen I matrix, mimicking normal human skin,. The reconstitutive skin model was treated with each extract for 7 d, and mRNA levels of melanogenic enzymes were examined by real-time PCR analysis. 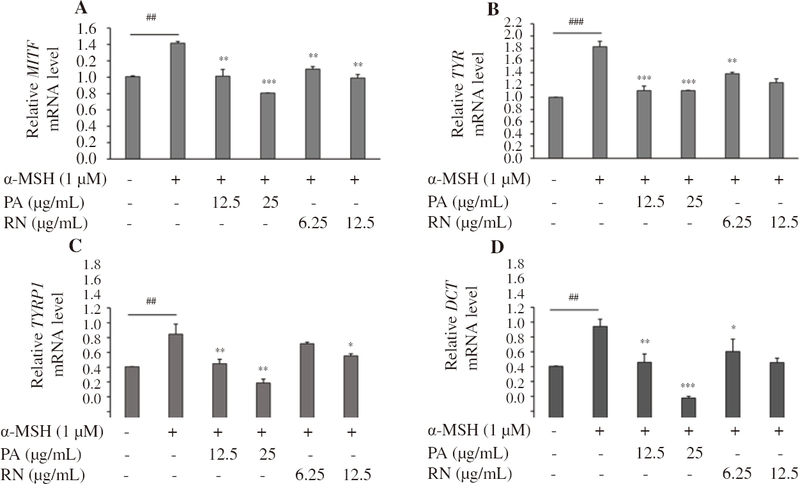 As shown in [Figure 4]A,[Figure 4]B,[Figure 4]C,[Figure 4]D, P. acidus (at 25.0 μg/mL) and R. nasutus (at 12.5 μg/mL) significantly suppressed mRNA levels of MITF, TYR, TYRP1 and DCT when compared with untreated control. It is noteworthy that the suppression of melanogenetic gene by P. acidus and R. nasutus extracts was more than kojic acid (at 125 μg/mL). We also confirmed that P. acidus and R. nasutus extracts significantly decreased tyrosinase protein expression compared to the control model [Figure 5]. Thus, in agreement with the anti-melanogenic effect of P. acidus and R. nasutus in monoculture of NHEM, we observed P. acidus and R. nasutus extracts decreased the transcriptional and translational levels of melanogenic enzymes in the reconstitutive skin culture model. Figure 4: Effects of PA and RN extracts on mRNA levels of melanogenic enzymes in the reconstitutive skin model. (A) MITF, (B) TYR, (C) TYRP1, and (D) DCT were examined by qPCR, using GAPDH as an internal control. *P<0.05, **P<0.01, ***P<0.001 compared with α-MSH treated cells. KA 125: kojic acid at 125 μg/mL. Figure 5: Effects of PA and RN extracts on the expression of tyrosinase protein in the reconstitutive skin model. Data are the mean±SEM from three independent experiments. *P<0.05, **P<0.01 compared with control without extract treatment. KA 125: kojic acid at 125 μg/mL. Ting PT, Barankin B. Brown macules on the cheeks. Can Fam Physician 2005; 51: 353-355. Wang SQ, Lim HW. Principles and practice of photoprotection. Switzerland: Springer International Publishing; 2016. Sheehan JM, Cragg N, Chadwick CA, Potten CS, Young AR. Repeated ultraviolet exposure affords the same protection against DNA photodamage and erythema in human skin types II and IV but is associated with faster DNA repair in skin type IV. J Invest Dermatol 2002; 118: 825-829. Costin GE, Hearing VJ. Human skin pigmentation: melanocytes modulate skin color in response to stress. Faseb J 2007; 21: 976-994. Wolf Horrell EM, Boulanger MC, D’Orazio JA. Melanocortin 1 receptor: Structure, function, and regulation. Front Genet 2016; 7: 95. Roh E, Yun CY, Young YJ, Park D, Doo KN, Yeon HB, et al. cAMP-binding site of PKA as a molecular target of bisabolangelone against melanocyte-specific hyperpigmented disorder. J Invest Dermatol 2013; 133: 1072-1079. Beaumont KA, Newton RA, Smit DJ, Leonard JH, Stow JL, Sturm RA. Altered cell surface expression of human MC1R variant receptor alleles associated with red hair and skin cancer risk. Hum Mol Genet 2005; 14: 2145-2154. Brenner M, Hearing VJ. Modifying skin pigmentation-approaches through intrinsic biochemistry and exogenous agents. Drug Discov Today Dis Mech 2008; 5: e189-e199. Leyden JJ, Shergill B, Micali G, Downie J, Wallo W. Natural options for the management of hyperpigmentation. J Eur Acad Dermatol Venereol 2011; 25: 1140-1145. Bandyopadhyay D. Topical treatment of melasma. Indian J Dermatol 2009; 54: 303-309. Kumari OS, Rao NB, Chawhan LP, Rachel B. Phyto-chemical anaysis of Phyllanthus acidus amarus (Nelausiri), Phyllanthus emblica and Phyllanthus acidus. World J Pharm Res 2014; 4: 1457-1462. Abd Ghafar SZ, Mediani A, Maulidiani, Ramli NS, Abas F. Antioxidant, α-glucosidase, and nitric oxide inhibitory activities of Phyllanthus acidus and LC-MS/MS profile of the active extract. Food Biosci 2018; 25: 134-140. Zheng XH, Yang J, Lv JJ, Zhu HT, Wang D, Xu M, et al. Phyllaciduloids A-D: Four new cleistanthane diterpenoids from Phyllanthus acidus (L.) Skeels. Fitoterapia 2018; 125: 89-93. Jain NK, Singhai AK. Protective effects of Phyllanthus acidus (L.) Skeels leaf extracts on acetaminophen and thioacetamide induced hepatic injuries in Wistar rats. Asian Pac J Trop Med 2011; 4: 470-474. Talubmook C, Buddhakala N. Hypoglycemic and hypolipidemic properties of leaf extracts from Phyllanthus acidus (L.) Skeels., Leucaena leucocephala (Lam.) de Wit. and Psidium guajava (L.) in streptozotocin-induced diabetic rats. GSTF J Bio 2013; 2: 30-34. Singh J, Kaur S. Phyllanthus embilica leaves extract: A potential amylase enzyme inhibitor with antioxidant and antimicrobial activity. Int J Clin Pharmacol Res 2015; 5: 200-206. Nguyen TTK, Laosinwattana C, Teerarak M, Pilasombut K. Potential antioxidant and lipid peroxidation inhibition of Phyllanthus acidus leaf extract in minced pork. Asian-Australas J Anim Sci 2017; 30: 1323-1331. Hossain S, Akter S, Begum Y, Bulbul IJ. Analgesic and anti-inflammatory activities of ethanolic leaf extract of Phyllanthus acidus L. on swiss Albino mice. Chem Cent J 2016; 13: 1-10. Uddin S, Mamun AA, Hossain S, Ashaduzzaman M, Noor AA, Hossain S, et al. Neuroprotective effect of Phyllanthus acidus L. on learning and memory impairment in scopolamine-induced animal model of dementia and oxidative stress: Natural wonder for regulating the development and progression of alzheimer’s disease. Adv Alzheimer Dis 2016; 5: 53-72. Sowmya C, Lavakumar V, Venkateshan N, Ravichandiran V, Saigopal DVR. Exploration of Phyllanthus acidus mediated silver nanoparticles and its activity against infectious bacterial pathogen. Chem Central J 2018; 12: 42-42. Jayapriya G, Gricilda SF. Phytochemical analysis and antimicrobial efficacy of Rhinacanthus nasutus (l) Linn. J Pharmacogn Phytochem 2015; 3: 83-86. Bhusal N, Panichayupakaranant P, Reanmongkol W. In vivo analgesic and anti-inflammatory activities of a standardized Rhinacanthus nasutus leaf extract in comparison with its major active constituent rhinacanthin-C. Songklanakarin J Sci Technol 2014; 36: 325-331. Brimson JM, Tencomnao T. Bioactive nutraceuticals and dietary supplements in neurological and brain disease. In: Watson RR, Preedy VR. Rhinacanthus nasutus extract as a neuroprotectant. San Diego: Academic Press; 2015, p. 77-84. Ho NH, Inbaraj BS, Chen BH. Utilization of microemulsions from Rhinacanthus nasutus (L.) kurz to improve carotenoid bioavailability. Sci Rep 2016; 6: 25426. Raj VBa, Kumar SS, Kumar KS. HPTLC standardization and quantification of Rhinacanthus nasutus. J Med Plant Stud 2015; 3: 51-55. Ngoc TM, Phuong NTT, Khoi NM, Park S, Kwak HJ, Nhiem NX, et al. A new naphthoquinone analogue and antiviral constituents from the root of Rhinacanthus nasutus. Nat Prod Res 2018; 1: 1-7. Kwak HJ, Park S, Kim N, Yoo G, Park JH, OH Y, et al. Neuraminidase inhibitory activity by compounds isolated from aerial parts of Rhinacanthus nasutus. Nat Prod Res 2018; 32: 2111-2115. Puttarak P, Charoonratana T, Panichayupakaranant P. Antimicrobial activity and stability of rhinacanthins-rich Rhinacanthus nasutus extract. Phytomedicine 2010; 17: 323-327. Rao PV, Madhavi K, Naidu MD. Hypolipidemic properties of Rhinacanthus nasutus in streptozotocin induced diabetic rats. J Pharmacol Toxicol 2011; 6: 589-595. Visweswara Rao P, Madhavi K, Dhananjaya Naidu M, Gan SH. Rhinacanthus nasutus improves the levels of liver carbohydrate, protein, glycogen, and liver markers in streptozotocin-induced diabetic rats. Evid Based Complement Alternat Med 2013; 2013: 1-7. Shah MA, Jakkawanpitak C, Sermwittayawong D, Panichayupakaranant P. Rhinacanthins-rich extract enhances glucose uptake and inhibits adipogenesis in 3T3-L1 adipocytes and L6 myotubes. Pharmacogn Mag 2018; 13: S817-S821. Sajeda D, Kumar LL, Peera K, Raju KT. Restoration of pathological changes in kidney tissues from diet induced obese rats treated with Rhinacanthus nasutus (Linn) Kurz leaf extract. World J Pharm Pharm Sci 2018; 7: 822-828. Chatatikun M, Chiabchalard A. Thai plants with high antioxidant levels, free radical scavenging activity, anti-tyrosinase and anti-collagenase activity. BMC Complement Altern Med 2017; 17: 487. Kim JH, Kim DH, Cho KM, Kim KH, Kang NJ. Effect of 3,6-anhydro-l-galactose on alpha-melanocyte stimulating hormone-induced melanogenesis in human melanocytes and a skin-equivalent model. J Cell Biochem 2018; 119: 7643-7656. Yamauchi T, Yamasaki K, Tsuchiyama K, Koike S, Aiba S. The potential of muse cells for regenerative medicine of skin: Procedures to reconstitute skin with muse cell-derived keratinocytes, fibroblasts, and melanocytes. J Invest Dermatol 2017; 137: 2639-2642. Yamauchi T, Yamasaki K, Tsuchiyama K, Koike S, Aiba S. A quantitative analysis of multilineage-differentiating stress-enduring (Muse) cells in human adipose tissue and efficacy of melanocytes induction. J Dermatol Sci 2017; 86: 198-205. Hayashi MA, Bizerra FC, Da Silva PI Jr. Antimicrobial compounds from natural sources. Front Microbiol 2013; 4: 195-195. Chatatikun M, Yamauchi T, Yamasaki K, Aiba S, Chiabchalard A. Anti melanogenic effect of Croton roxburghii and Croton sublyratus leaves in α-MSH stimulated B16F10 cells. J Tradit Complement Med 2018; 9(1): 66-72. Desjardins P, Conklin D. NanoDrop microvolume quantitation of nucleic acids. J Vis Exp 2010; 45: 2565. Liu BY, Lu YQ, Han F, Wang Y, Mo XK, Han JX. Effects of the overexpression of IFITM5 and IFITM5 c.-14C>T mutation on human osteosarcoma cells. Oncol Lett 2017; 13: 111-118. Nemoto E, Shimonishi M, Nitta Y, Shimauchi H. The involvement of platelet-derived growth factor receptors and insulin-like growth factor-I receptors signaling during mineralized nodule formation by human periodontal ligament cells. J Periodontal Res 2004; 39: 388-397. Qiao Z, Koizumi Y, Zhang M, Natsui M, Flores MJ, Gao L, et al. Anti-melanogenesis effect of Glechoma hederacea L. extract on B16 murine melanoma cells. Biosci Biotechnol Biochem 2012; 76: 1877-1883. Chen YM, Shih TW, Chiu CP, Pan TM, Tsai TY. Effects of lactic acid bacteria-fermented soy milk on melanogenesis in B16F0 melanocytes. J Funct Foods 2013; 5: 395-405. Tabassum N, Hamdani M. Plants used to treat skin diseases. Pharmacogn Rev 2014; 8: 52-60. Bart DW, Sandrine K, Pascal D. Human skin models for research applications in pharmacology and toxicology: Introducing nativeskin®, the “missing link” bridging cell culture and/or reconstructed skin models and human clinical testing. Appl In Vitro Toxicol 2015; 1: 26-32. Williams R. Tanning with p53. J Cell Biol 2007; 177: 5. Oren M, Bartek J. The sunny side of p53. Cell 2007; 128: 826-828. Suzuki I, Cone RD, Im S, Nordlund J, Abdel-Malek ZA. Binding of melanotropic hormones to the melanocortin receptor MC1R on human melanocytes stimulates proliferation and melanogenesis. Endocrinol 1996; 137:1627-1633. Chen H, Weng QY, Fisher DE. UV signaling pathways within the skin. J Invest Dermatol 2014; 134: 2080-2085. Saha B, Singh SK, Sarkar C, Bera R, Ratha J, Tobin DJ, et al. Activation of the MITF promoter by lipid-stimulated activation of p38-stress signalling to CREB. Pigment Cell Res 2006; 19: 595-605. Addor FASa. Antioxidants in dermatology. An Bras de Dermatol 2017; 92: 356-362. Pillai S, Oresajo C, Hayward J. Ultraviolet radiation and skin aging: Roles of reactive oxygen species, inflammation and protease activation, and strategies for prevention of inflammation-induced matrix degradation-a review. Int J Cosmet Sci 2005; 27: 17-34.